Type 2 diabetes is linked to lifestyle. If left untreated it can lead to serious health problems such as stroke, blindness, heart disease, kidney failure and lower limb amputation. In 2016 the NHS Diabetes prevention programme was launched to provide personalised help to reduce risk of Type 2 diabetes including education on healthy eating and lifestyle, help to lose weight and bespoke physical exercise programmes, all of which together have been proven to reduce the risk of developing the disease. Our aim is to promote the Healthier You campaign and help raise awareness of how diabetes can be prevented. 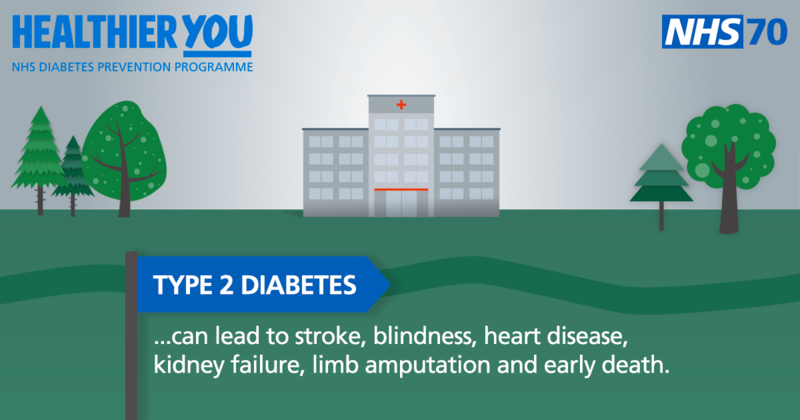 We know Type 2 diabetes can be prevented by managing your weight, eating healthy and being more active. Whether you are living with diabetes or not, eating well is important. The foods you choose to eat in your daily diet make a difference not only to managing diabetes, but also to how well you feel and how much energy you have every day. One of the main risk factors of Type 2 diabetes is being overweight and having high blood pressure. Other risk factors include genetics, risk increasing with age and if you are from South Asian, Caribbean or Black African descent. 1, Ensure you have a balanced diet which includes a variety of fruit and vegetables, dairy, carbohydrates and protein. Contact One You Hounslow to help you eat well, move more, drink less or stop smoking 020 8973 3530 and sign up to some of our exciting activities to help you improve your health and wellbeing.